Quick Facts: Distance From Sydney:177kmhttp://www.bluemts.com.au/images/glo...ow-whiteBG.gif http://www.bluemts.com.au/images/tou...s/Jenolan1.jpg http://www.bluemts.com.au/images/global/spacer.gifWhile the Blue Mountains often portrays Jenolan Caves as one of its own tourist attractions, Jenolan Caves is actually part of the spectacular Oberon area. Jenolan Caves is however within easy reach of the Mountains making it ideal for a day trip. http://www.bluemts.com.au/images/tou...s/Jenolan2.jpgJenolan Caves are without question, Australia's most impressive limestone caves. The caves were discovered in 1838 by a convict bushranger. There are nine show caves open to the public with spectacular lighting, underground rivers and cave formations that will amaze you. Tour guides take you through the caves. Some caves are tougher than others. 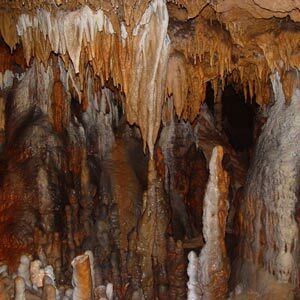 Jenolan Caves also offer adventure tours, picnic facilities and bush walking tracks. The drive to Jenolan Caves is also a pleasant experience. http://www.bluemts.com.au/images/tou...s/Jenolan3.jpgThe natural welcoming of the Grand Arch is unforgettable.The acoustics of the Archway make carols by candlelight at Christmas a truly magical event! En Tunisie également, on a des grottes magnifiques au même titre que les grottes australiennes, tels que la magnifique grotte de la mine à Kairouan, la plus vaste en Afrique du Nord mais non encore aménagée pour le tourisme. Fuseau horaire GMT +1. Il est actuellement 03h49.